The All-New X-Men are no longer all-new to comics, with over 30 issues of the hit series available to read, and the first hardcover collection hitting comic shops today. But one thing they are all-new to is toys! Diamond Select Toys is unleashing their 59th assortment of Marvel Minimates on comic shops and specialty stores this week, and it includes the first-ever toys based on the All-New X-Men team in their all-new costumes! s everyone knows, the All-New X-Men are the five original X-Men, brought from the past to the present day in their teenage years, and one of the first orders of business (after confronting the grown-up Cyclops about his extreme behavior) is new costumes! 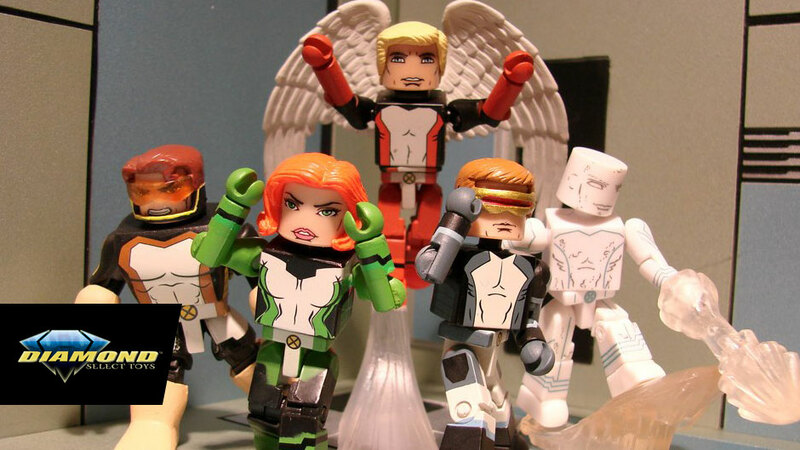 This assortment of Minimates features the new, color-coded looks in four two-packs: Cyclops with Marvel Girl, Beast with Angel, Iceman with a Sentinel and a rare, short-packed Bobby Drake with a Sentinel. Build the entire original team in one fell swoop! Each Minimate mini-figure stands approximately two inches tall and features a variety of interchangeable parts and accessories, including alternate heads and hair for Beast, Cyclops and Marvel Girl; flight stands for Jean Grey and Angel; an optic blast for Cyclops; an ice blast and an ice slide for Iceman; and an ice blast and ice block for Bobby Drake! Plus, the modern Sentinel has a blast base, detachable tendrils that can grab the X-Men and removable shoulder pads to become a classic Sentinel! Whether you’re a fan of the characters, the book, or the new costumes, it’s a great week to swing by your local comic shop and pick up some mini-mutants! Check out the photos of the figures in action, then find your local retailer at ComicShopLocator.com!